Fall is the time for pomegranates. When I was younger, living in Houston, we spent a lot of time at the house of my parents' best friends. One of their neighbors, I think they lived next door to the people directly behind them, had a pomegranate tree. I have one memory of tackling one - it was not very sweet and it was an awful lot of work to get the seeds out. That one time was pretty much it for me. It was more trouble than it was worth, other than on those rare occasions when they garnished my entree at an up-scale middle eastern restaurant. As I started to expand my cooking repertoire, I began using it more, mostly in the form of a pomegranate molasses I created myself by reducing the hell out of a bottle of 100% pomegranate juice. It's a crucial component in Muhammara, of which I have become quite fond. So of course I started thinking about getting my hands on another one to see how I would respond to the taste today. And since they're all over the stores right now it was too easy to throw one into my basket. Which I did last Saturday. Completely on impulse. With no real idea what I was going to do with it, unless it was to watch it get more wrinkly every day until I finally give up and throw it away (like I did the last time I had the urge to buy one about four years ago). And then Sunday morning I was on the phone with my sister having our usual weekly food conversation, when from out of the blue (I swear) she confessed to an urge to buy a pomegranate. She laughed when I told her I had actually succumbed to the impulse just the day before, but she had no better ideas than I did what to do with it. 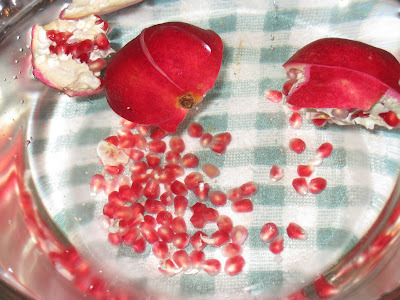 In the years since I last bought a pomegranate, I had heard something about how easy it is to get the seeds out if you fill a bowl with water and separate the seeds from the pulp in the bowl. The seeds settle down to the bottom of the bowl and the pulp floats. I tried it out, and I am happy to say that works. The seeds do settle down at the bottom of the bowl, and the pulp does float there on top and is very easy to remove. And here are the seeds. They really do look like little gems, don't they? I have been using them to garnish just about everything. They are especially good in salads. And someday soon I am sure I will get ambitious enough to make my own grenadine or pomegranate molasses with them. Fill a large bowl about halfway with cold water. Cut the ends off of a pomegranate and, using a paring knife, score the skin lengthwise, making each slice about 1-1/2 to 2 inches apart. 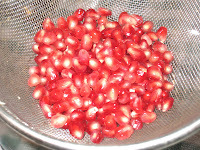 Put the scored pomegranate into the water and let it soak for five minutes. Break the pomegranate apart into segments, using the scored areas as your guide. With the segment underwater and using your fingers, scrape the seeds away from the pulp. Remove the pulp from the top of the water, then strain the seeds. And that's it. Nothing could be simpler, and they brighten up just about every dish.